Home > Customer Service > Payment > What is Laybuy? Laybuy lets you receive your purchase now, and spread the cost over 6 weekly payments interest & fee free! Simply select the Laybuy payment option when you check out. Your order is processed once the first payment has been made and your payment schedule is established. Only a sixth of the total order cost is due today. The rest is split over 5 weekly automatic payments on the day of the original purchase. How much does Laybuy cost? Nothing! Laybuy is free to use; you will not be charged interest or any fees. Just the total order amount. Laybuy is available for New Zealand residents over the age of 18 with a valid credit card or debit card. Laybuy is not currently available for international customers, sorry. We’ll dispatch your order as soon as your first payment has been made. 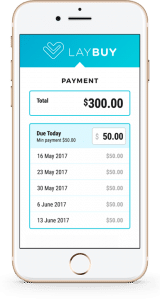 If you fail to make a payment, a default fee of $10 may be charged by Laybuy. Additional failure to make payments will result in further charges being applied to your account by Laybuy. These fees will be incurred for each payment that is late. Laybuy is a third party service and is not provided by The Beauty Lounge. We offer you the ability to pay for your order through Laybuy but we do not service their platform. For questions regarding your order, please contact us. For questions regarding the payment of a Laybuy order, please contact Laybuy.